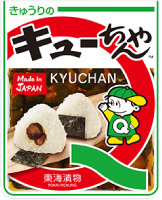 KYUCHAN offers typical Japanese pickled cucumbers, with a crunchy texture and soy sauce flavor that is a perfect complement to hot rice. 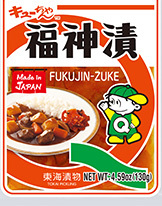 These Japanese pickles are prepared with soy sauce, sugar, and a selection of seven vegetables (radish, cucumber, eggplant, lotus root, sword bean, ginger, and perilla). 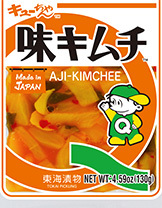 AJI-KIMCHEE features a classic kimchi flavor with a touch of garlic, with pickled radishes and cucumbers. 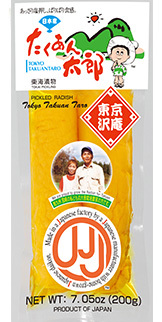 These Japanese pickles made from radishes are a great match for rice or fish-based dishes. Their appeal is in their crunchy texture. 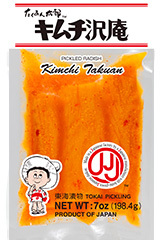 This product features well-dried pickled radishes flavored with garlic-tinged kimchi.